Robert Leury, vice president and general manager of the Empire State Building saw the Mustang sales figures and thought he’d love to gain a slice of that frenzy. In the fall of 1965, Leury invited Ford division merchandising manager William Benton in for a meeting to discuss how to pull off a headline-grabbing spectacle. What follows is one of the most outrageous examples of 1960s-era advertising moxie. After the meeting Benton returned to Dearborn and formed a tidy team of eight with one goal: Put a 1966 Mustang on the 86th floor observation deck of the world’s tallest, most iconic building. The challenges were significant. 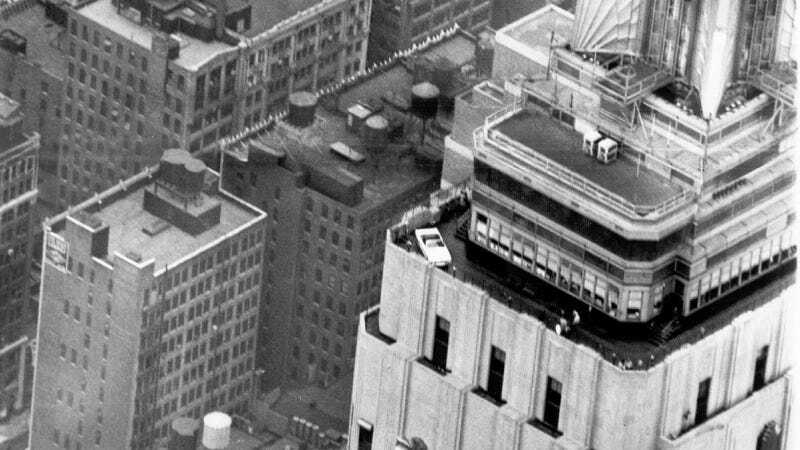 Due to the building’s stupendous spire and sloping upper architecture, it was determined that lowering a complete car onto the observation deck via helicopter was just too complex and dangerous, so another approach had to be developed. This is where Ford engineers set to work. The crew took a trip to New York, measuring tapes in hand, carefully noting the dimensions of the building’s doorways, halls, rooms and elevators. After some back-of-the-napkin calculations the plan was set: Slice a perfectly good ‘66 Mustang convertible into pieces, stuff it into the passenger elevator, then put it back together at the top. The trick would be to split the car and put it back together in such a way that it wasn’t apparent as anything but a production vehicle – no cuts to the sheet metal, no trick hinges or fake fiberglass panels. Everything had to appear to be stock Mustang. The front seats, center console and doors were temporarily removed to simplify access. Next, the engine, transmission and driveshaft were removed. At this point, they could do the dirty work and cut the floor pan out – the rear slice was done right at the rocker panel below the trailing edge of the door, while the front followed the seam at the bottom of the leading edge of the door. The final cut was at the base of the windshield frame. Now the trick was putting it back together. A series of brackets was designed and fabricated so the pieces of the car could slide together and be bolted in place, once again rigid enough to act as a display car. This sort of high-profile marketing no doubt played a part in getting people into showrooms that year. In 1966, Ford sold an incredible 607,568 Mustangs – the most ever in a single year. By March 1966, an unbelievable 1 million copies had been sold since launch – just about the same time the little white Mustang convertible on top of the Empire State Building was about to retire from the highest showroom in the world.